Papaya performing at Seattle's Gasworks Park. In the 70's there was a band in Seattle called Papaya. They played clubs including The Bicycle Club in Pioneer Square. A self produced album which was quite good had some regional play. 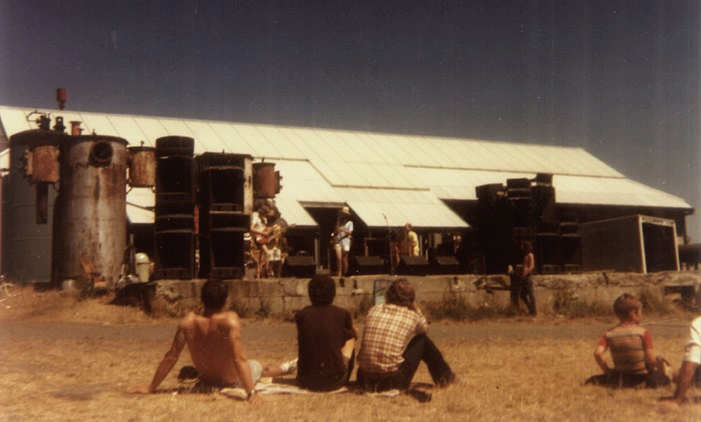 It was recorded at The Music Farm. Players were Martin Lund on sax and flute, who now lives on Orcas Island. I believe after a career producing in LA and continues to make music with his wife and daughter. Luis Peralta was on percussion and Brian Chambers on electric guitar. Unfortunately the other player's names are not coming to me at the moment. They were a very good Latin Jazz hybrid dance group who were in fact a bit ahead of their time with some truly fine players. Murl, Martin, Danny and Luis are still gigging and rippin' it up in their own way. Peter Brown is still active in the Skagit County. He plays lots of Country Swing, hooked up with Skagit Community Band, the Skagit Symphony, and North Cascades big band. He gets called for gigs around here. Brian Chambers (guitar) went on to play lead with The Acoustinauts, then formed a 10-piece band, Rio Skyline, which played all his compositions. A second version of Rio Skyline had Brian on bass and Samia Panni on vocals, doing Brazilian popular music. Later on he played bass with a couple of African bands, Je Ka Jo and Smell No Taste. He took a break from active playing when he moved to Bainbridge in 2000, but has recently formed a band called Moment's Notice, playing jazz, Latin and original music. Almost 70 and still going strong! Luis Peralta went on to play drums for Dizzy Gillespie.